We have mentioned how the viscosity of the magma and the amount of gas dissolved in it determine how explosive an eruption is. But what makes magma gas-rich or gas-poor? What makes magma so viscous that it can builds a stubby lava flow tens of meters high, or so fluid that it can slosh up against the side of a steep cone? There are several factors that determine magma viscosity but chemical composition, temperature, the amount of dissolved gases, and the proportion of solid materials (such as crystals) are the most important. Starting with chemical composition, the key factor affecting viscosity is the amount of silica (which is found as SiO2) in the magma. 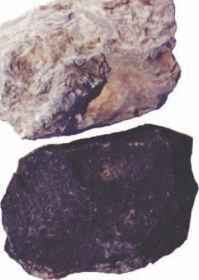 Basalts, often referred to as basic or mafic rocks, have a relatively low percentage of SiO2. 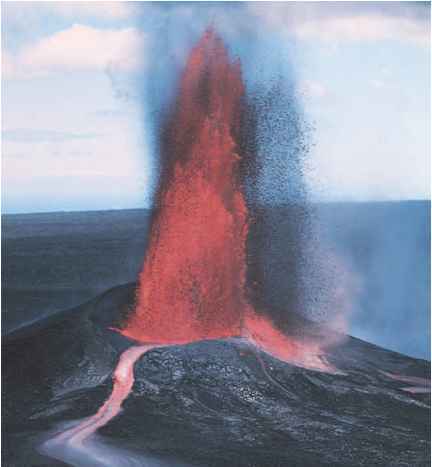 Basaltic magma comes from the upper regions in the mantle and erupts in relatively primitive, or unaltered, condition. Basalts are usually dark in color because of their component minerals, which are mostly feldspar and pyroxene, with smaller amounts of the green mineral olivine. Other types of magmas - basaltic andesites, andesites, dacites, and rhyolites - contain progressively higher amounts of silica and they are often referred to as silicic, acidic, or evolved magmas. 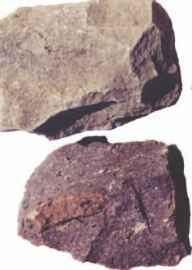 They are usually much lighter in color than basalts and contain mostly quartz and feldspar (Fig. 2.8). Silica content, together with alkali content, forms the basis of classification of volcanic rocks, as shown in Fig. 2.9. The silica content (SiO2 percentage) is plotted in one axis and the sum of the amount of sodium and potassium is plotted as a percentage on the other axis. Most of these names will not be referred to in this book, so readers who are starting to find these explanation too detailed need not worry. It is, however, useful to know that volcanic rocks and lavas are grouped in this way. SiO, breaking down the bonds between silica and oxygen. For example, water in the magma lowers viscosity but carbon dioxide increases it. More alkaline magmas tend to be less polymerized and, therefore, flow more easily. The amount and size of solid crystals also have an effect on viscosity: the greater the percentage of solid crystals per unit volume, the more viscous the magma. In basaltic lavas, crystals (mostly olivine and pyroxene) typically take up only a few percent of the volume, but in dacites the crystals (mostly feldspar) can form as much as 40% of the total volume. We can compare these to cake batter: basaltic magma would be like a white, fluffy cake batter, while a crystal-rich dacite would resemble a heavy fruit-cake mixture. The white cake mixture will be much easier to stir with a spoon and to pour into a baking pan. Most people are aware that temperature influences the viscosity of fluids. This is why people who drive cars in cold climates use a different grade of oil in winter than in summer. The viscosity of magmas also changes with temperature: the hotter the magma, the more easily it can flow. How hot is magma? This, once again, depends on the composition, as shown in Table 2.1. Basalts erupt at hotter temperatures than the more silicic magmas. While basalt will be mostly solid below 1000 °C (1800 °F), the hottest rhyolites never reach that temperature. Since viscosity decreases with temperature, the hotter basalts (those around 1200 °C, 2200 °F) will be more fluid than the cooler ones. If you have noticed that the temperature ranges in Table 2.1 overlap, you may wonder what happens if, for example, a basaltic and an andesitic magma are erupted at the same temperature (say 1000 °C). Will they have the same viscosity? The answer is no, because the more silicic magmas are always more viscous than the less silicic ones at a given temperature: a 1000 °C andesite will flow less easily than a 1000 °C basalt. Lastly, let's consider gas content. Without a significant amount of gas, even the most viscous magma will not make a big bang, but just ooze out slowly. The word "gas" is used here in a loose way. Volcanologists tend to refer to gases as volatiles - a term that also includes water which will come out of the magma as steam. The amount of volatiles in the magma is linked to composition: basalts typically have less than 1% of volatiles per unit volume, while silicic magmas have more - rhyolites may contain as much as 5%. Thus it is not hard to see why silicic magmas are potentially more explosive than basalt: they have more gas and are more viscous. Looking again at the distribution of volcanoes around the world, we can better understand why explosive volcanoes are clustered along the Ring of Fire, while those with gentler eruptions are clustered along mid-oceanic ridges and hot spots. 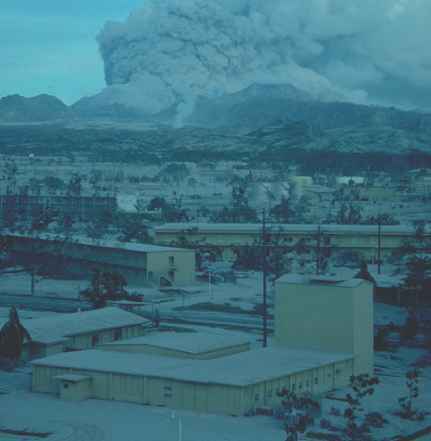 A volcano's explosivity is linked to the composition of its magma. The magma composition, in turn, is dependent on the volcano's tectonic setting: mid-oceanic ridge volcanoes erupt basaltic magma, while more silicic magmas are erupted along subduction zones. There are some exceptions to this general trend. Some subduction zone volcanoes are not particularly explosive. One example is Masaya in Nicaragua, which had predomi nantly gentle basaltic activity, though a sudden explosion in 2001 sent tourists scrambling (luckily, nobody was hurt). In contrast, some mid-oceanic ridge volcanoes, such as Hekla and Katla in Iceland, have had violent explosive eruptions in the past. 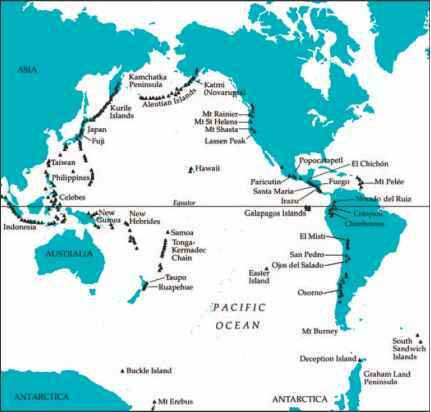 In general, however, volcanoes sharing the same tectonic setting erupt in a similar way. As we will discuss in the next chapter, volcanoes that are siblings in terms of tectonics will tend to grow up to look alike and to show many similarities in terms of their eruptive personalities. Interpretation of Igneous Rocks. Allen and Unwin. Decker, R. W. and B. B. Decker (1991) Mountains of Fire: The Nature of Volcanoes. Cambridge University Press. University Press. Scarth, A. (1994) Volcanoes. Texas A&M University Press.